Peerless LCFS-100 is a pedestal stand to mount your television for a floor stand application. It's perfectly suited for several public places where, for viewing purposes, you need a free-standing solution to mount an LCD TV. If necessary, you can event bolt this pedestal stand to the floor for more stability. Use LCFS-100 for a television that has a screen size from thirteen to thirty and support VESA compatible 75/100 hole patterns. It has an all-steel construction with capabilities for height adjustment or swiveling up to 90° on both sides. You can also move its feet inward for certain applications. Use LCFS-100 in a shopping mall, studio setting or in a gymnasium. LCFS-100 is pedestal stand to mount your television. 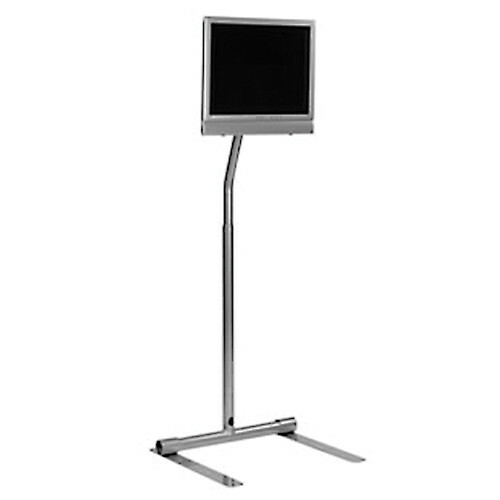 Use this stand for LCD TVs in a shopping mall, studio setting or in a gymnasium. In a free-standing application, it can support a weight of up to twenty-five pounds. For more stability, bolt this stand to the concrete of wooden floor and support more weight (up to forty pounds). This stand is perfectly suited LCD TVs that has a screen size of thirteen to thirty inches and support VESA compatible 75/100 hole patterns. You can also adjust the height as well as swivel on both sides. Manage the cords inside the tubular construction of its all-steel structure. Box Dimensions (LxWxH) 62.0 x 12.0 x 4.5"
LCFS-100 Pedestal Stand for 13 to 30" LCD TVs - Black is rated 3.7 out of 5 by 10. Rated 3 out of 5 by BMS from Does the job, with a few minor bugs After using it for one trade show, I can say that this stand is solid. It does the job sufficiently. I'm not a fan of the small allen-wrench set-screws...they scratch the metal and god-forbid you are stuck without an allen wrench. The biggest fault, by far, is the hole for cables is too small for VGA and DVI cables!! In other words, these cables can't go through the center of the tube because the connectors can't fit through the hole! So, you'll probably have to dress the wires externally...be warned. For the price, its a good solution, assuming you are ok with the downsides, which I've listed above. Rated 3 out of 5 by brainburst from Could have been much better Small set screws are pretty ridiculous. From a structural point of view this is badly designed. As a general rule, screws should not be relied upon to hold thing together. In this case the assembly is held to gether by 1/4 set screws. The assembly should have been designed so all fittings are reasonably snug with set screws just to lock them in positions. This worked for me only by eliminating adjustability and setting for a fixed height by eliminating the joining tube and inserting the mainpole directly in base. Nothing else equivalent near its price point so what else could I do? Rated 4 out of 5 by AL in CA from You pay for what you get I purchased this monitor stand for a trade show. It was completely adequate for this purpose, but don't expect anything outside of the most basic functions. The adjustments are extremely crude and secured using small set screws. That means that every time you change the height the set screws scratch the finish. Rated 4 out of 5 by Slab from Nice Solution for a Standing Display This stand is used as a mount for a small information display. It is very easy to assemble making it good moving to any location that you may need it. I couldn't get the VGA cable through the post though. I wish it were another millimeter in diameter. Rated 5 out of 5 by Anonymous from Great product for a dorm room! We bought the pedestal stand since my daughter cannot wall mount her flat screen TV in her dorm room. The stand solves that problem and the TV can easily be moved around during the school year and brought home over the summer. The power and cable cords are run from the back of the TV into the stand itself them come out the bottom so there is no wires to look at. My daughter said it was very easy to assemble and holds her 24 flat screen LCD TV with no problem. Rated 4 out of 5 by David from Strong stand with nice finish I saw some review that complained about the allen wrench scratching the metal. Bah....no problem at all. Once you have them setup they are sturdy, attractive and non-obtrusive. The only comment I have is that the cable opening needs to be bigger at the top so you can fit larger plugs through. Rated 4 out of 5 by Anonymous from Good buy at a good price! We use it in the Gym. It's now in front our elliptical machine ! Be carefull with your screwdriver, you can easily scratch it. It took only 5 days to receive it from B&H and delivred in Montreal. Rated 2 out of 5 by GoPro_Tour from Unstable; hard to assemble At a very affordable price, however, assembly instructions are difficult to understand and the whole unit seems very unstable. The height is adjustable between 60.75 to 80.00 inches on this Pedestal Stand. How do you adjust the stand to make it taller? To adjust the stand there is set screws at the bottom and at the top of the pole that allow you to adjust for the proper height desired. what is the length of the base feet? The length of the feet are 24 inches.